Combine brine ingredients except cold water in a large pot and bring to a simmer. Simmer for a few minutes to make sure sugar and salt are dissolved. Cover and let sit for 10 minutes. Add brine to a large pot or five gallon bucket with 20 cups of cold water. This should cool off the brine to below room temperature. If it is still warm, add a few cups of ice to the mixture. Remove giblets from turkey if they are included and add thawed turkey to the brine mixture, making sure it covers the bird. Add more ice to the mixture to keep it cool. Cover and store in a cool place (outside works if it gets to 40 degrees at night) overnight. You can also just keep adding ice to the mixture occasionally to keep it cool. In the morning, remove turkey and rinse it very well in a clean sink. Remove all debris from bird and wash it well to remove brine. Pat dry with paper towels. Preheat oven to 500°F. Place turkey in roasting pan and make sure it is very dry. Insert probe thermometer in largest part of breast, going in through the front of the bird. 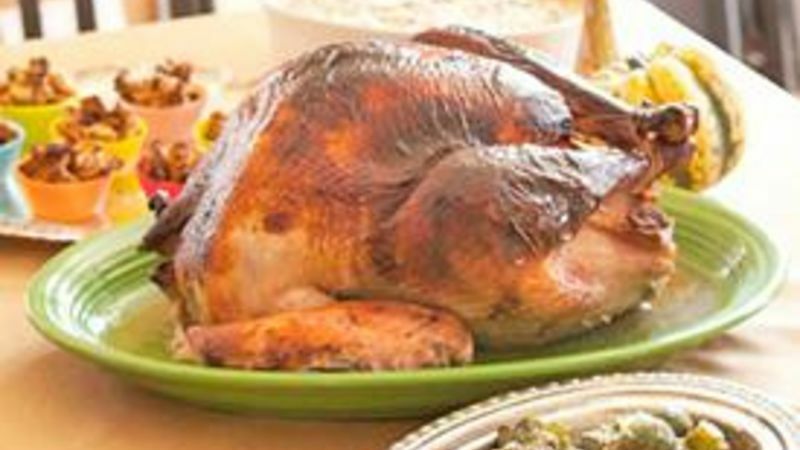 Make a large triangle out of aluminum foil and mold the foil to fit over the breast of the turkey. Once shaped, remove foil and store until needed. Add two quartered lemons, a sprig of rosemary, and a sprig of sage to the cavity of the turkey. Brush entire turkey with canola oil and bake for 30 minutes at 500°F. After thirty minutes, gently place the foil triangle on the breast to guard it from the heat, turn the oven temperature down to 350°F, and let it cook until the temperature in the breast reaches 162°F. Remove turkey and cover loosely with foil. Let rest for 25-30 minutes before carving.